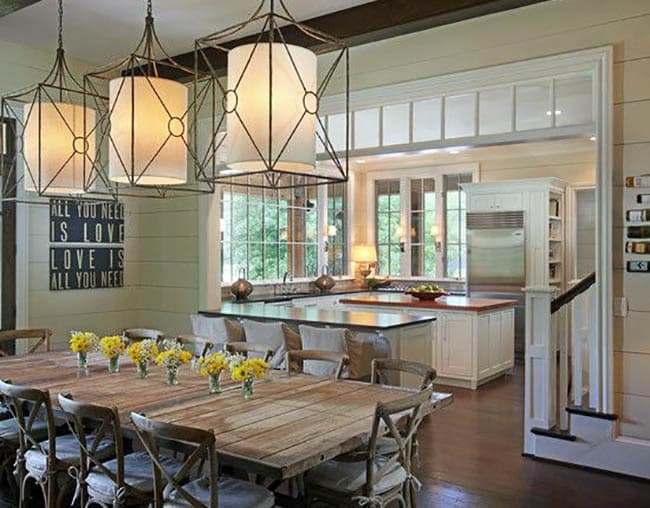 Welcome to our gallery of shiplap dining room ideas including popular ways to bring this coastal cottage & farmhouse trend in to your own home. 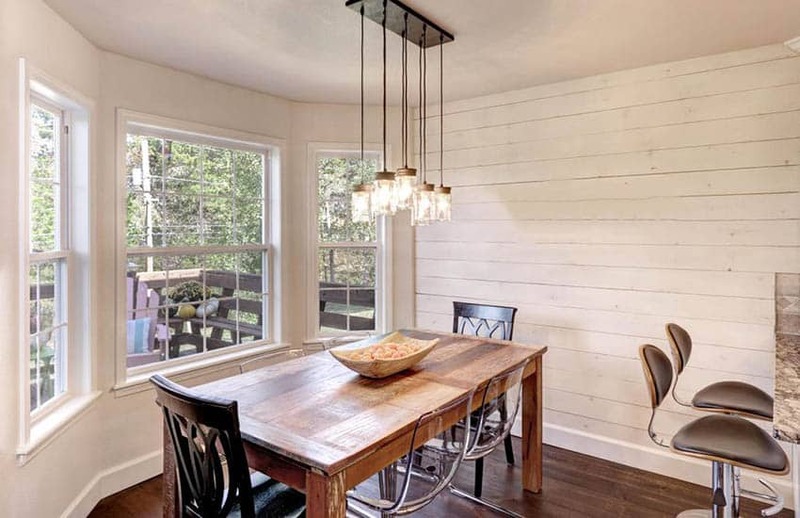 Shiplap has become quite popular in recent years, once relegated to the exterior of barn walls, this rough-sawn 1” pine, (or equally inexpensive wood) this board is now the darling of interior designers and home-owners alike. Shiplap can be easily installed over drywall for a simple update or in lieu of drywall for those who are building or doing a major remodel. One of the reasons that shiplap has become so popular is because it is surprisingly versatile. From industrial and modern to more traditional and even French country, shiplap can help anchor your look. It can be painted or stained, and while we see it installed horizontally more often than not, installing it vertically adds interest and offers a unique and beautiful spin on this classic material. 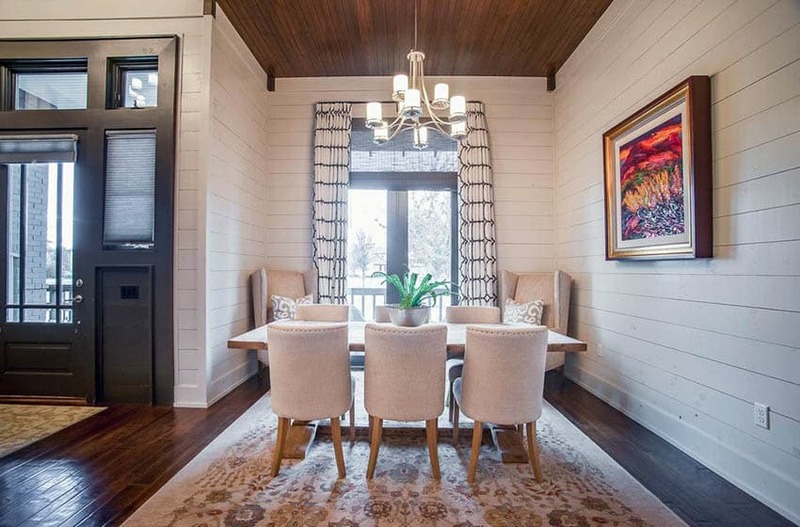 Providing an attractive alternative from traditional wainscoting, a shiplap wall can create visual interest and help you bring your own personal touch to your dining room. 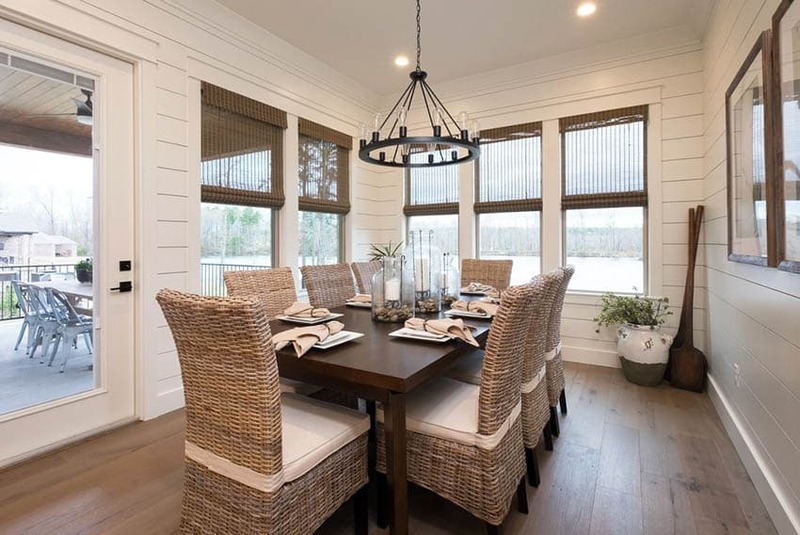 This beautiful shiplap dining room has a coastal design with light hardwood flooring, wicker backed chairs and jute woven wood shades. Anchor the look with dark wood flooring, a modern brightly colored rug, and simply framed photography on the walls. To add an industrial edge, swap out your standard ceiling light for a raw light fixture containing rubbed metals, glass, and exposed bulbs. 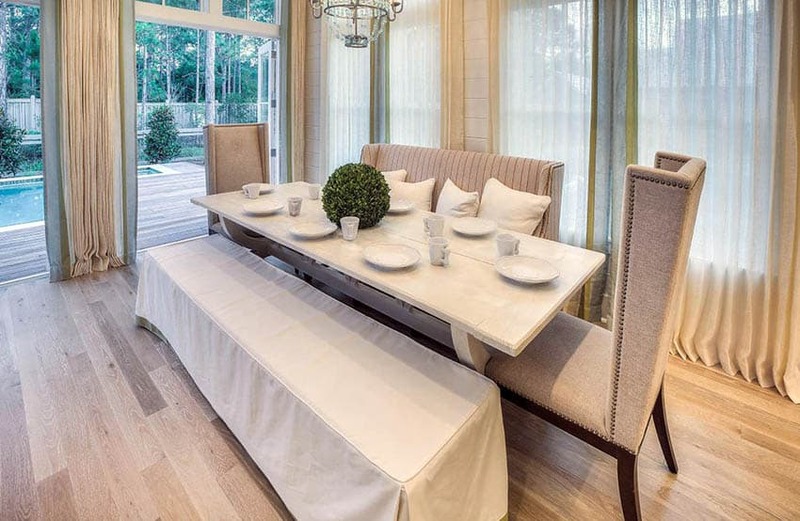 Trade the streamlined chairs out for chairs made with custom-made leather seats and tubular steal frames. The mixture of textures creates a warm, lived in look that invites people to sit down and stay awhile. 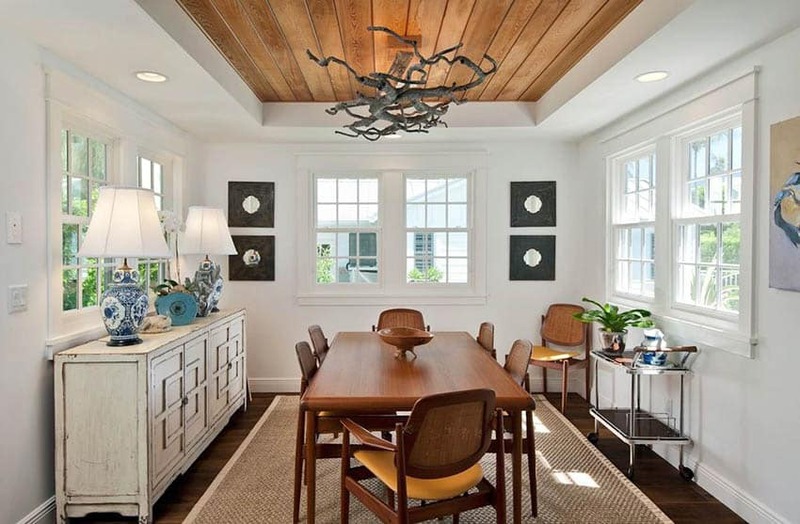 A wood shiplap ceiling can really give your dining room a classy coastal or cottage style that you’ll love. 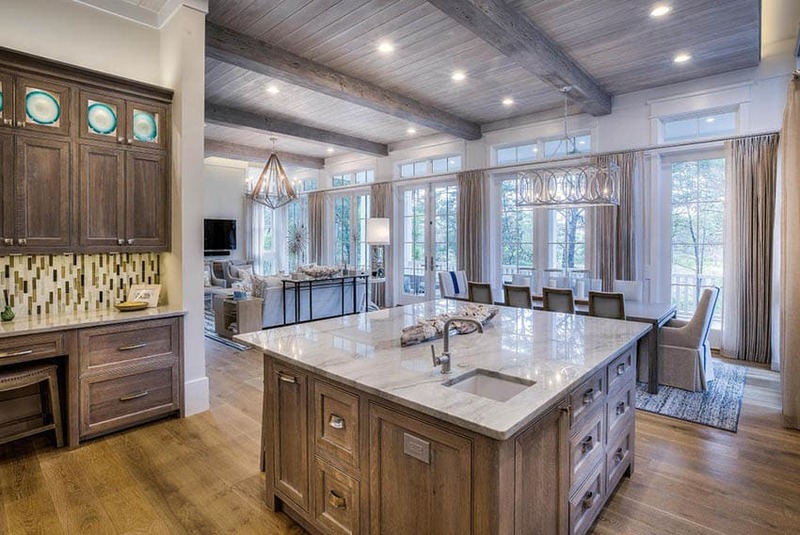 For a more traditional look, consider installing shiplap on your ceiling and keeping the walls a standard drywall texture. Accent this look with upholstered dining chairs like the Hayes Tufted Dining Chair from Pottery Barn, a simple, scaled chandelier, and round dining table. If you don’t want to shiplap the ceiling, this look can be just as stunning with ship lapped walls. If you want a more coastal traditional look, use natural woven rattan, such as the Kubu Dining Chair from Pier 1 and a reclaimed teak table. Use a worn Indian rug woven in pale blues, greens, and creams and airy linen draperies. Flip your shiplap vertically, paint it creamy almond or earthy light mushroom. Add a simple, thin-lined black iron chandelier, an antique wood table, and the beautiful Bluffton Side Chairs from Wayfair and you have the base for a variety of looks depending on how you accessorize. For a French Countryside feel, bring in vases of fresh flowers, raw silk draperies the same color as the wall, and simple antique sideboard or buffet. Of course installing a dining room with French doors is a sure way to bring in elegance and plenty of natural light to brighten things up. If you want a sophisticated American country look, go for a woven cotton rug in a simple geometric pattern, such as the Bonnie Grey by Dash&Albert to anchor your table. Repaint an old pie safe or hutch with a soft milk paint, frame your artwork with natural wood frames and white matting. A simple cotton subtly colored drapery with plenty volume so they billow nicely when the windows are open is a must for any country décor. For those of us who are more eclectic or want a global look, shiplap is perfect. Try painting it a dark, moody color. Black Flame works great, whether you are using the shiplap as an accent wall or on all 4 walls, Black Flame will create a sophisticated but not stuffy feel. And the texture that the shiplap adds will create interest. Because this color is as versatile as the shiplap, you can pair it with whatever you like. A beat-up pub table and dramatic velvet-upholstered wingback chairs, a sleek modern dark wood table with clear acrylic chairs, or anything in between can work here. Bring in your favorite Persian rug and put a cozy armchair in the corner right next to a bookshelf full of vintage cookbooks for a marvelous meal-planning spot. Keep your draperies simple, a solid color or maybe a lattice design in a monochromatic scheme suspended from a brushed-bronze rod. The Geometric Gold and Silver leaf lantern from shades of Light is perfect for any transitional style with it’s blend of classical design and modern finishes. If you live in an apartment or rental and can’t just shiplap until your heart is content, don’t worry, there is a solution for you. 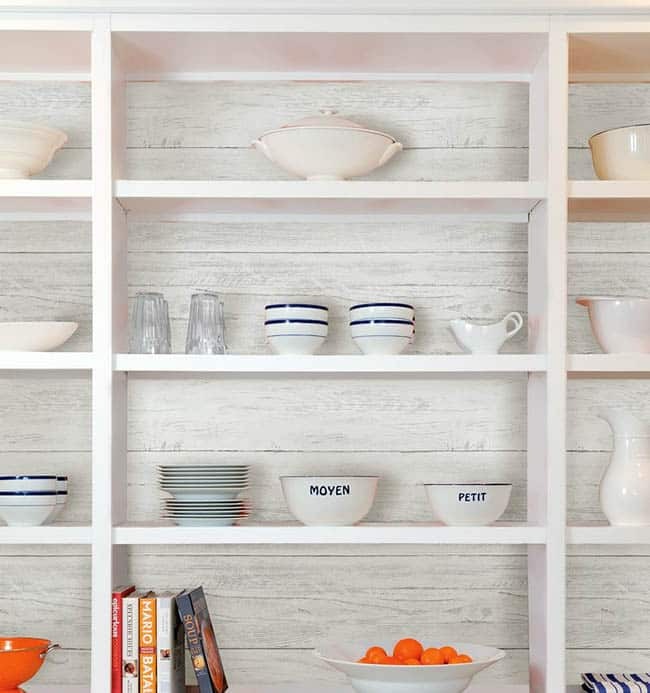 Removable shiplap wallpaper is a thing! This wallpaper is great for those who move frequently or aren’t allowed to permanently alter their walls. This wallpaper is available online and from most large hardware chains. Shiplap has been immortalized on design shows and is the darling of rustic and country interiors. 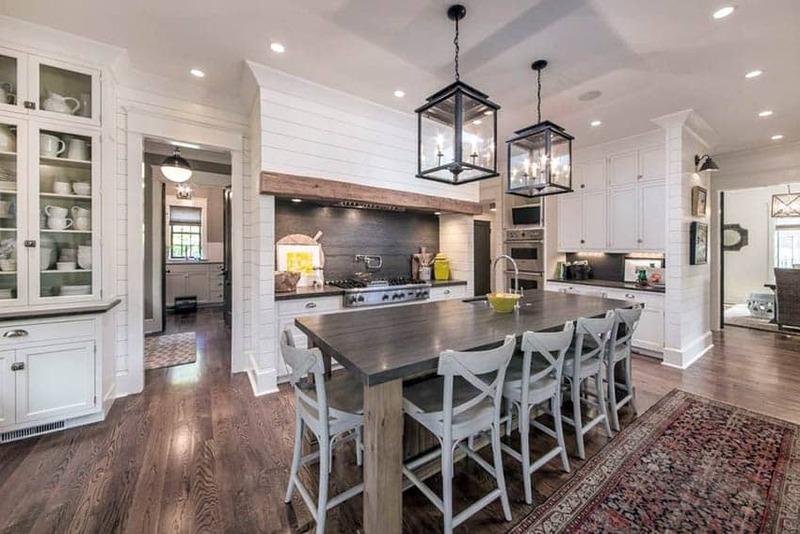 But shiplap doesn’t stop at country, it is a versatile, inexpensive way to add texture and interest to just about any style décor.